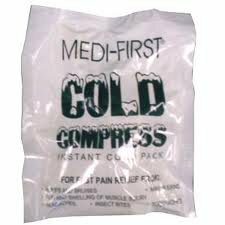 Medi-First Instant Cold Compress - 1 Count. Perfect for any first aid kit, these cold packs are convenient and simple to use. Be prepared for minor medical needs and keep one in you first aid cabinet at all times. Each compress is designed for 1 time use. Medi-First Instant Cold Compress - 1 count. Each compress is disposable and designed for 1 time use. Perfect for your First aid kit and very simple to use.